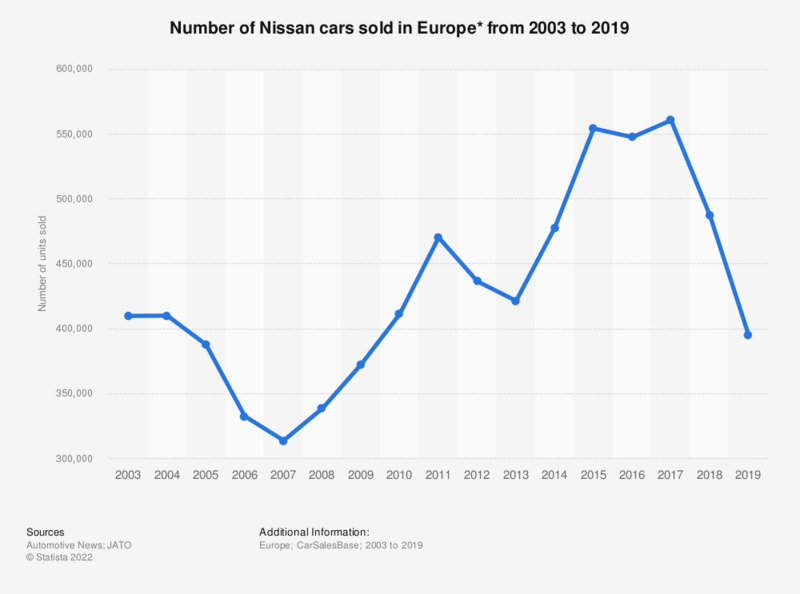 This statistic shows the number of cars sold by Nissan in Europe between 2003 and 2018. European sales of the Nissan cars rose from 400 thousand units sold in 2003 to over 560 thousand units sold by 2017. In 2018, there were 487 thousand units of Nissan cars sold in Europe. * Car sales statistics are from the following countries: Austria, Belgium, Cyprus, Czech Republic, Denmark, Estonia, Finland, France, Germany, Greece, Hungary, Iceland, Ireland, Italy, Latvia, Lithuania, Luxembourg, Netherlands, Norway, Poland, Portugal, Romania, Slovakia, Slovenia, Spain, Sweden, Switzerland, United Kingdom. ** Data collected by Left-Lane.com from multiple sources, including manufacturer data, ANDC and JATO Dynamics. Everything On "Nissan in the United Kingdom" in One Document: Edited and Divided into Handy Chapters. Including Detailed References.